Have you heard? The American Academy of Pediatrics issued its 2016 recommendations about screen times for children. Their report makes it clear that there are long-term negative consequences for introducing screens too early or allowing kids to view them for too long. Screens includes electronic devices like smartphones, tablets, TVs, gaming consoles and other similar toys. This group of over 64,000 pediatric professionals has reiterated its stance that entertainment screens should not be introduced before a child is 18 months old. After that, they recommend no more than one hour per day from 18 months to 5 years old, with parents actively watching with their young children to provide context. Whoa, you say! That’s not possible – there are screens everywhere. Or, you might be thinking, I need to use screens to keep my young child quiet in public. We have all been there. This is not a sanctimommy post – but a practical set of guidelines to help you navigate a challenging issue. First Things First: Why Should You Care? Obesity: It’s no surprise that the more time children spend sitting, the less time they spend engaged in physical activity. 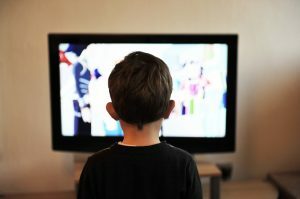 Couple that with the finding that with every hour of television, children consume an additional 167 kcal/day and you have a high risk of obesity. Development Delays: Research in this area is evolving, but there is generally thought to be potential impact on attention span, ability to concentrate, speech development, social skills and behavior management. Sleep Challenges: Increased electronics usage can lead to later bedtimes (generally in older children), suppression of melatonin, issues ‘settling’ into bedtime routines for high-energy shows and games. Sleep is critical for kids’ development – a good night’s sleep can dramatically improve brain function. Aggression: Studies of younger ages are mixed, because young children are generally less able to control their aggressive impulses than older children, both because of developmental differences and the ability to communicate frustration verbally. Nonetheless, there is considerable evidence that children are very likely to mimic the kinds of aggressive acts they see on screens (including cartoon violence). 1 – It’s never too late to set guidelines for screen time. An easy option is to set a rule from the outset that screens are only for weekend use. Apple has come up with some handy tools to limit usage on iPad and iPhone that limit the need for you to be the enforcer. 2 – Just as screens and games have evolved in recent years, so too have non-electronic activities. For babies and toddlers, there are plenty of toys and books that can easily replace screens to keep kids engaged or distracted. 3 – When you are using screens, there are some apps that are better than others. Stay away from high-speed, action games and videos. Utilize games that require action/response from the toddler vs. those that are just for consuming fast imagery. Nursery rhyme apps, coloring apps, and letter drawing are some better choices.